Positive ION: Thursday & Friday Night! Every Thursday night is Weirdsville Movie Night at Weirdsville Records (36 New Street in Downtown Mount Clemens, inside Used on New Books & More)... and tonight is no exception! The feature for March 13th is the 1982 classic, Tron. If you have never experienced Weirdsville Movie Night, you really should check it out. Do not expect to see super-serious, trendy, avant-garde film fanatics soberly analyzing little-known flicks, here... it is more like being in the silhouette audience of Mystery Science Theater 3000. Don't take my word for it, just head on down there tonight, have a few laughs, and don't forget to tell 'em I sentcha! 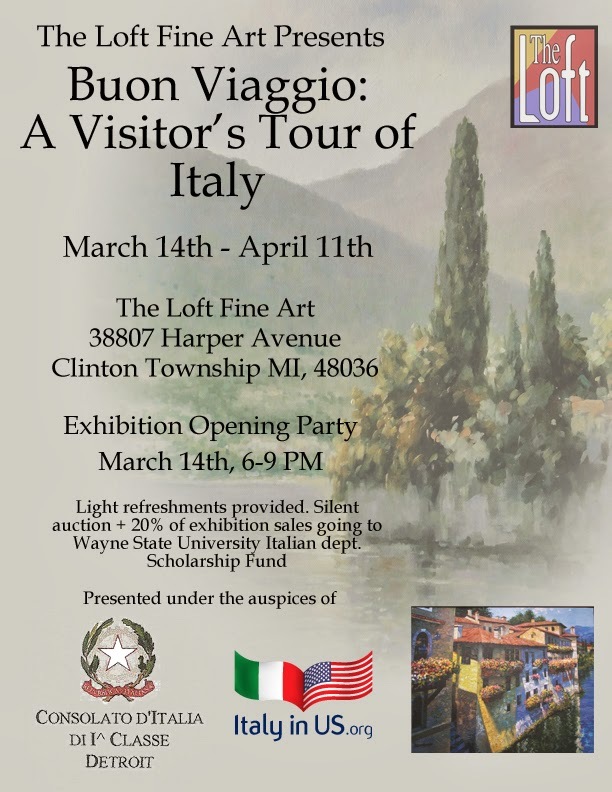 Tomorrow evening (March 14th) at The Loft Fine Art Gallery (38807 Harper in Clinton Township), there will be an Opening Reception for a fabulous exhibit of Italian landscapes and city scenes entitled Buon Viaggio: A Visitor's Tour of Italy. The exhibit (presented under the auspices of the Italian Consulate of Detroit) features paintings arranged geographically to give the suggestion of a journey through Italy within the gallery, including Venice, Tuscany, and other picturesque destinations. So, enjoy light refreshments and good company while you take a vacation far away from the Michigan weather. Details are on the flyer, which I have posted below.